Our first child, Sally was born on 6th November 1960. She had three younger brothers; Stephen, Simon and Adam. As a teenager, she discovered and developed a talent as an artist. At university, she studied Audiology and Education, qualifying as a teacher of profoundly deaf children. This experience led to a life-long passion for education, especially as it catered to the special needs of some children and enhanced the quality of their whole lives. In February 1987, Sally met Mark, an Australian, who was in England working with her brother Simon. It was the beginning of a life-long love affair, and within months of meeting, they were married. A few years later, they moved to live in Australia. They had four children; Amie, Jack, Patrick and Shannon. For the first ten years of their married life, Sally was a full-time mum, but she kept up her interest in education, and her concern for issues of justice and fairness. She had a talent for friendship, and her warmth toward everyone she met drew people to her side, where they felt welcome. In the years left to her, she was beginning to re-train to take up teaching again, and developed as an artist to the point where she was exhibiting her work. In 2005, two months after her 45th birthday, Sally was diagnosed with breast cancer and just 10 months later, she died on 20th December. More than a hundred people attended her funeral in the heat of the Australian summer, many of them returning early from holidays just to be there. When we returned home, many more were in touch with us regretting that they could not be there to celebrate her life. We realised just how many people there were, from around the world, whose lives had been touched by Sally, and who wanted to join us in building a living memorial to her. 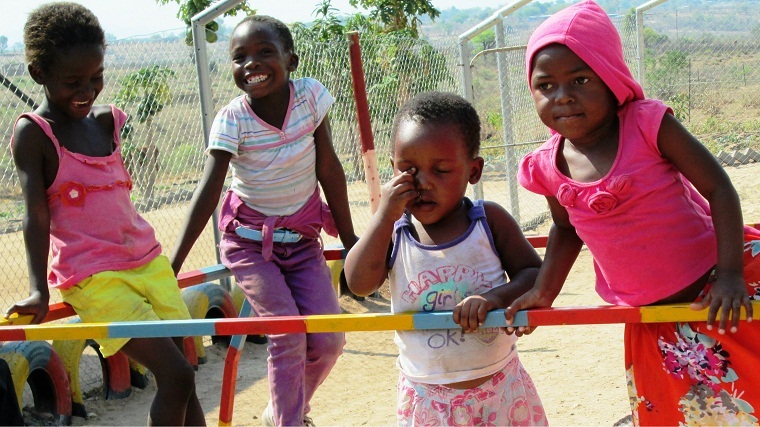 We got in touch with World Vision and immediately decided to raise money to build a crèche in Kodumela ADP in South Africa. 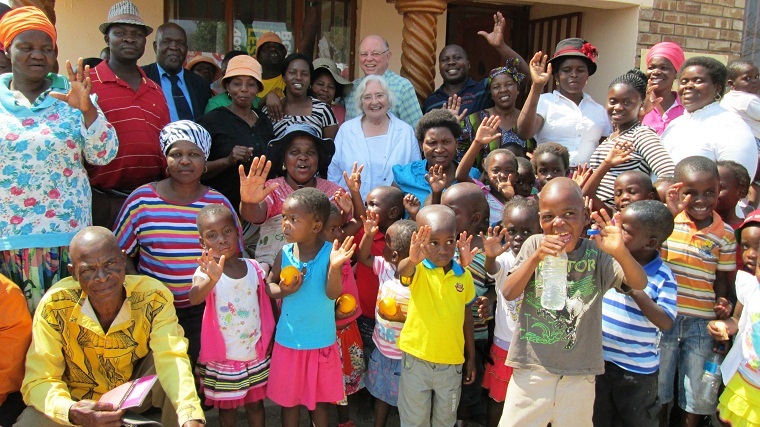 Within 6 months, £13,000 had been donated by Sally’s family and friends throughout the world. 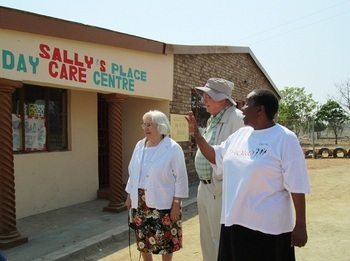 In 2013, more money was raised and we decided to visit Sally’s place again, for the second time. The first time we visited was for the opening, five years ago. We found the progress and development since then quite astonishing. The developments were immediately obvious: an extension to create another large classroom, all brightly painted, with walls covered in attractive teaching aids. Forty-four smiling children greeted us, reciting with pride their most recently learned names of months of the year and its seasons. Across the way, a new kitchen block has been built, so that the children are in no danger from the open fires which were the only means of cooking five years ago. 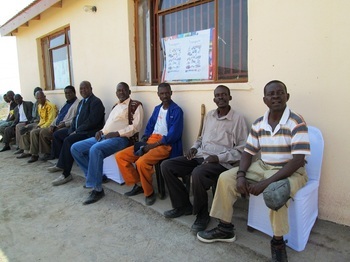 Breakfast and lunch are prepared for all the children, who attend the day care centre from 7.30 in the morning to 6.00p.m. 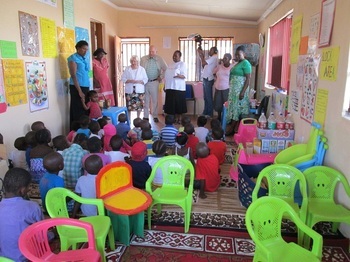 The feeding centre has moved down the road and is now a drop-in centre for children of any age, run by the government. This building is now converted into a computer centre, and is equipped with six computers, all being used when we were there. 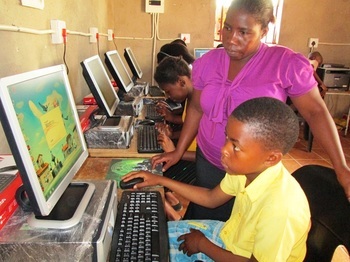 The extension and this new computer room were paid for by money raised by the Methodist churches in Melton Mowbray, U.K., where I served as minister in my last appointment. Other money raised has provided an adventure playground and a small garden for growing vegetables. One of the most exciting projects is just getting underway. The local families usually draw water from the huge tank which is currently the only water on tap in the village. However, there is water in the nearby mountains which could be piped down. A pipeline is now being built the provide the community with clean water. A group of men from the village are going into the mountains for periods of time to dig out channels for the piping, accompanied by women from the village who cook for them. Very soon now water will flow down these pipes into some spare land next to Sally’s Place, which will be turned into a market garden by the villagers to provide the vegetables for the children’s meals, and some to be sold to raise money for maintenance and development. Like the opening, the day spent at Sally’s place was a long day of celebration, with singing, dancing and speech making by representatives of the village community. Also present were government representatives, a local social worker w ho spoke of the work being done to make it a centre of excellence to which he could safely refer children in need. An embarrassing number of “Thank yous” were directed at us, when all the time we wanted to turn them back to the teachers and the village community whose hard work and dedication have transformed the few resources we gave, in memory of our daughter, into a place so special that it is known and cherished far beyond its bounds. 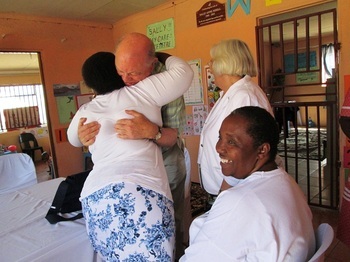 The constant references to the way “Sally’s” has grown in the affections and respect of people from miles around made the whole day very emotional for Barbara and me. To us, this is a very special place, where children are nurtured; a place of light and hope in a land whose people struggled for many years to achieve justice and reconciliation. We are proud that it bears the name of our beloved daughter, “Sally”. If you are inspired by Raymond and Barbara’s story, you can find out more about giving in memory of a loved one and recognise a cause they cared about during their lifetime on our website here. What would you most like named for you? Let us know on our Facebook page.